Whether you are leveling a field for a new construction project or want to ensure the right slope and grade to your landscape at home, professional grading and leveling services provide the right foundation for the job. 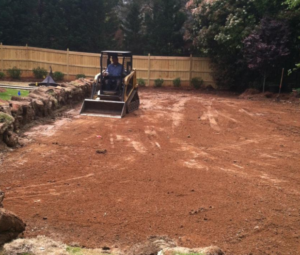 At Vision Green, we are pleased to offer the services of a professional Charlotte lawn grading service, ensuring you can get the exact shape and leveling effect you need for your project. In addition, if you need to change the slope or grade of your area in order to accommodate your landscaping or building goals, professional grading services can help. Whether you are installing a new driveway, leveling space for a garden or need a solid space to build an outbuilding, we have the equipment to get the job done well. Grading services from Vision Green go beyond just making the ground level, although that is a crucial part of what we do. We will also remove obstacles, like stumps or rocks, that are contributing to the unevenness of your ground. This is something best done by professionals with the right equipment, because these obstacles can be significantly heavier than you might think. Our grading services also include evaluation of the drainage and erosion of the space, allowing us to adjust the grading plan so that it will better control the water in the space, helping plants to grow better without increased watering needs. We may add or remove dirt to the space as needed to create the grade desired. The end result will be level, attractive and ready for your project. If you are in need of grading services, give Vision Green a call!